Posted on October 13, 2018 Posted in Unique	. 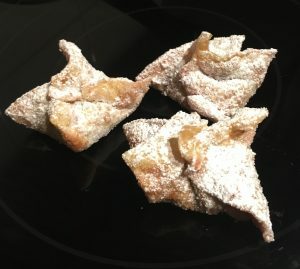 Out of all the sweet treats I have created over the years my favorite experimentation sessions are turning savory dishes into sweet. 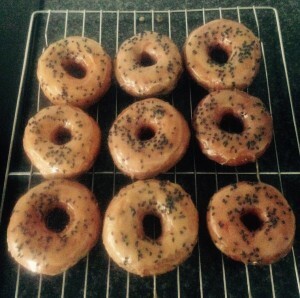 However, these type of baking ideas don’t come as frequently as thinking up unusual flavour combinations to experiment with. 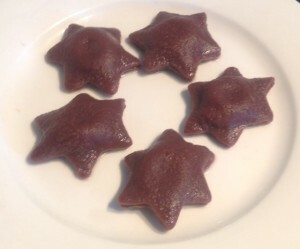 I did the other day have ravioli filled with sweet pumpkin and maple syrup which got me thinking of sweet ravioli…chocolate pasta…chocolate ravioli…white chocolate cream cheese filled chocolate pasta ravioli…why not? Not since my Green Tea and Pistachio Eclairs have I created a savory to sweet dish that is website worthy. 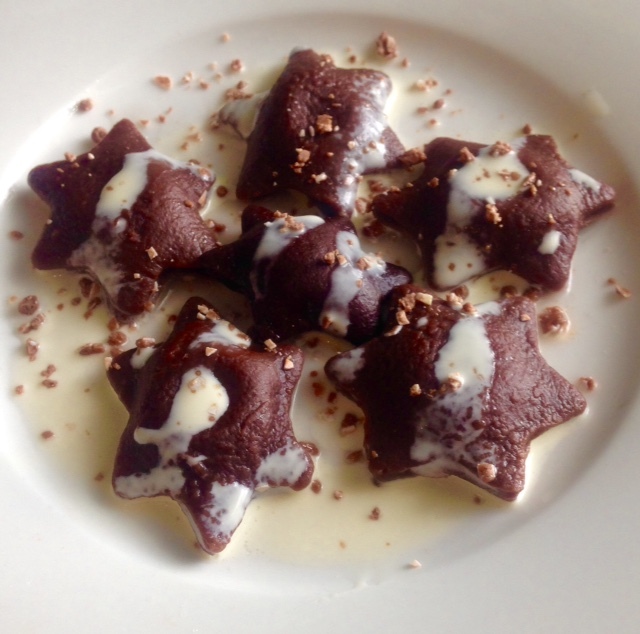 Therefore, introducing my Cream Cheese Chocolate ravioli. 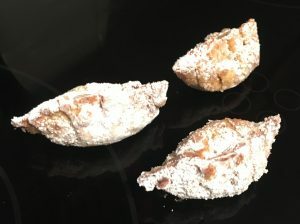 Place the flour, cocoa, salt and sugar in a bowl, stir. Make a well in the centre then add the beaten eggs and oil. 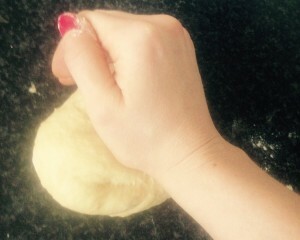 Mix with your fingers and knead the dough until smooth, following place the dough in the fridge for 30mins. 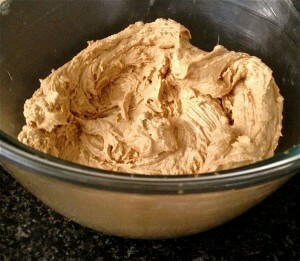 Next make filling by whisking the cheese in with electric beaters in a bowl until smooth. 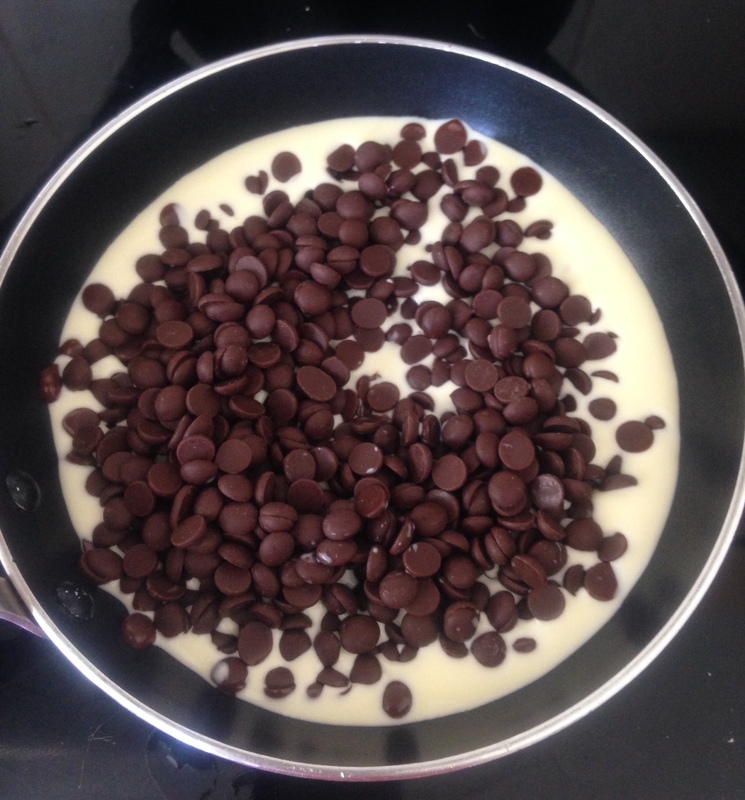 Place the white chocolate in a bowl under a bowl of water on the stove until the chocolate has melted. 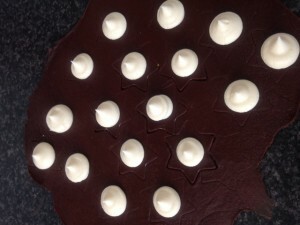 Allow the chocolate to slight cool then add to the cheese with the icing sugar and egg and whisk until smooth and creamy. Place the filling into a piping bag fitted with a circle nozzle. 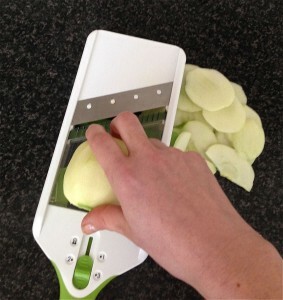 Cut the pasta into 2 even pieces. 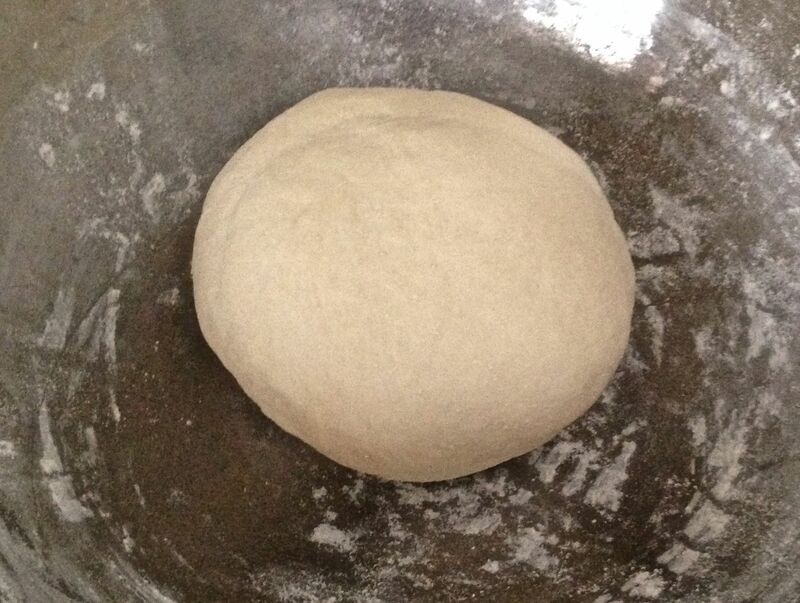 Roll out both pieces on a lightly floured surface until the dough is 3mm thick (or ideally use a pastry machine). Brush a pasta sheet with the milk. 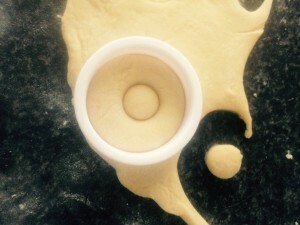 Pipe small 1 tsn dots of the cheese filling on to the pasta 4cm apart. 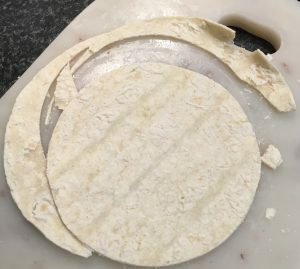 Place the second pasta sheet on top of the first and using a ravioli cutter or cookie cutter cut out the ravioli making sure the filling bump is in the middle of the cutter. Place ravioli pieces on a floured surface and let them dry out for 30mins. 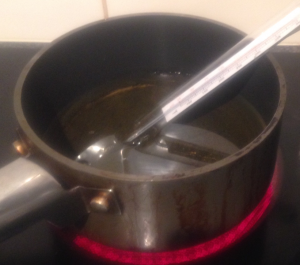 Bring a pot of water with 1 tsn of oil on the stove and bring to the boil. Once boiling turn the temperature to a simmer and place the ravioli in the water, simmering gently for 5 mins (or until pasta is cooked). Remove the ravioli with a slotted spatula/spoon and place pieces in serving bowls/plates. 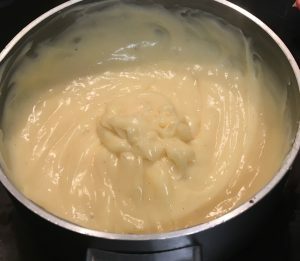 Add the white chocolate to the cream and heat in the microwave on medium in 30 second busts, stirring in between each interval until smooth. Serve by drizzling the chocolate cream over the ravioli pieces. 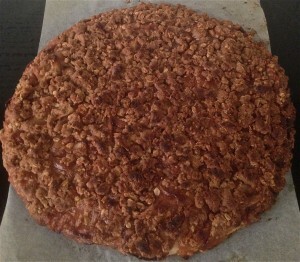 Scatter with the chocolate biscuit crumbs and enjoy. It is recommended to use a 5cm cookie cutter as making the ravioli to small will be difficult to seal the pasta. 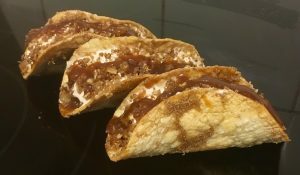 Tags: chocolate Ravioli, Cream Cheese Chocolate Ravioli, cream cheese filling	. Posted on July 29, 2017 Posted in Unique	. 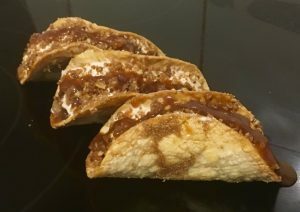 Inspired by the latest craze of turning the sweet onto the savory and the savory into the sweet. 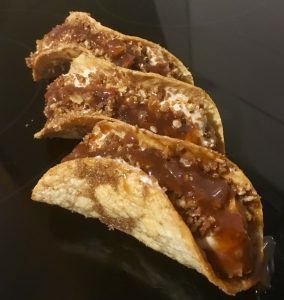 I have dabbled with this a little with sweet dumplings, ravioli and tacos as well as posted my Apple Crumble Pizza and my Chocolate Nut Springroll. However I still have many many more ideas on things to create. 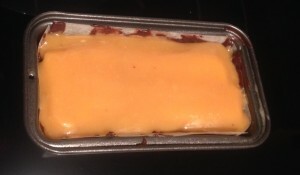 One item I have been meaning to turn from savory to sweet is lasagna. 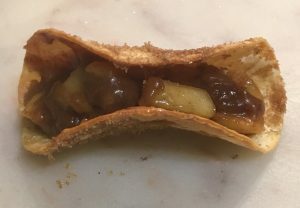 I have tried many savory versions of this dish, from a Mexican fest to vegan based-meals, however never a sweet one. 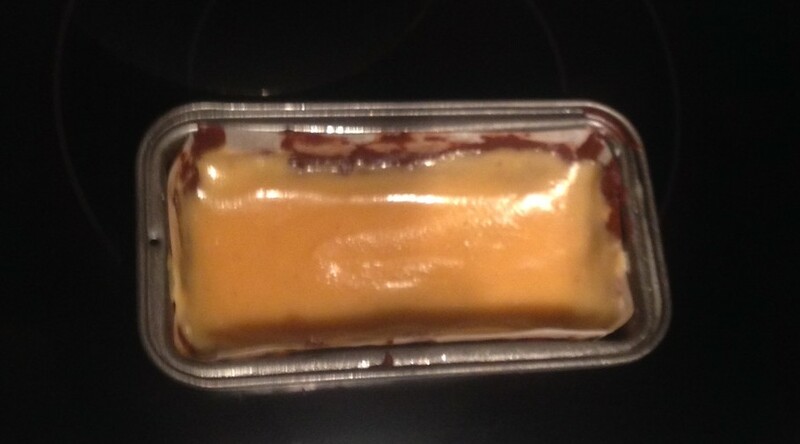 I figured using a cheese and crème patisserie fusion filling could replicate the cheese. 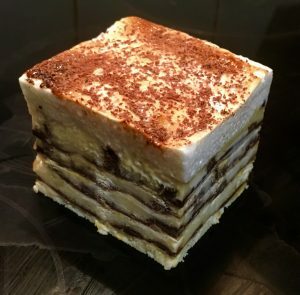 Using actual lasagna sheets covered in layers of chocolate and hazelnut spread would imitate the pasta and meat layers. And of course, not forgetting the white sauce top layer I made a delicious meringue to complete treat. I’m surprised at how good this turned out to the point that it for sure amazingly delicious. Line a 15cm x 30cm cake tin or deep oven dish with baking paper. 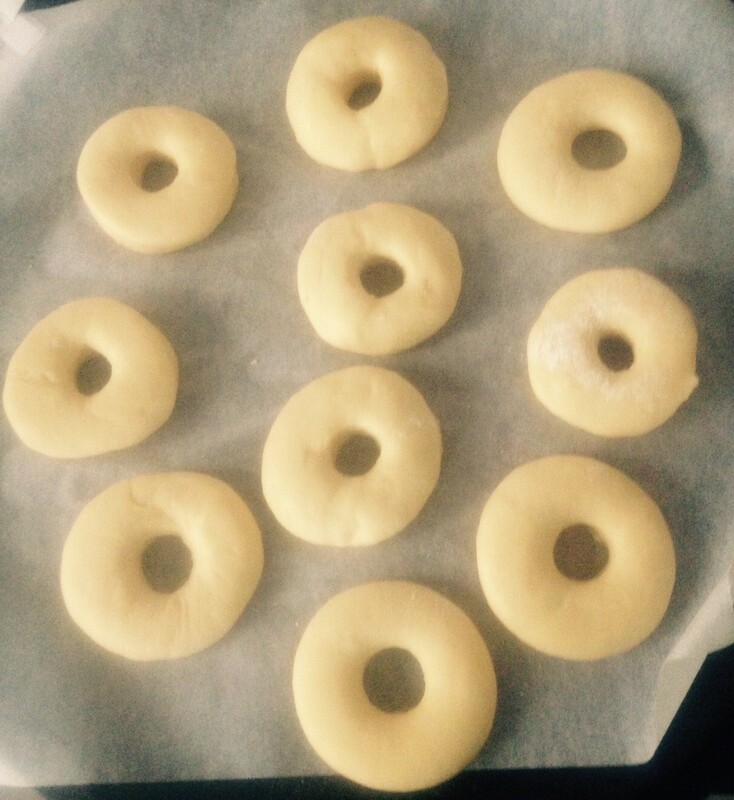 Make the filling by whisking with electric beaters the egg yolks, sugar, vanilla and cornflour until well combined. Leave the egg white aside for later use. Place the milk into a saucepan on high heat until the milk starts to boil. Add the milk to the yolk mix is a steady stream until well combined. 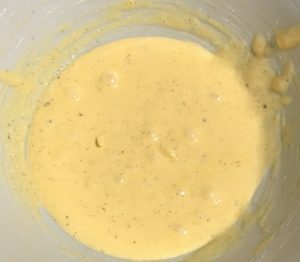 Transfer the mix back into the pan on a medium heat and using a hand whisk beat until the mix thickens up into a custard. Pour the mix into a bowl with plastic wrap on top and leave aside to cool completely. 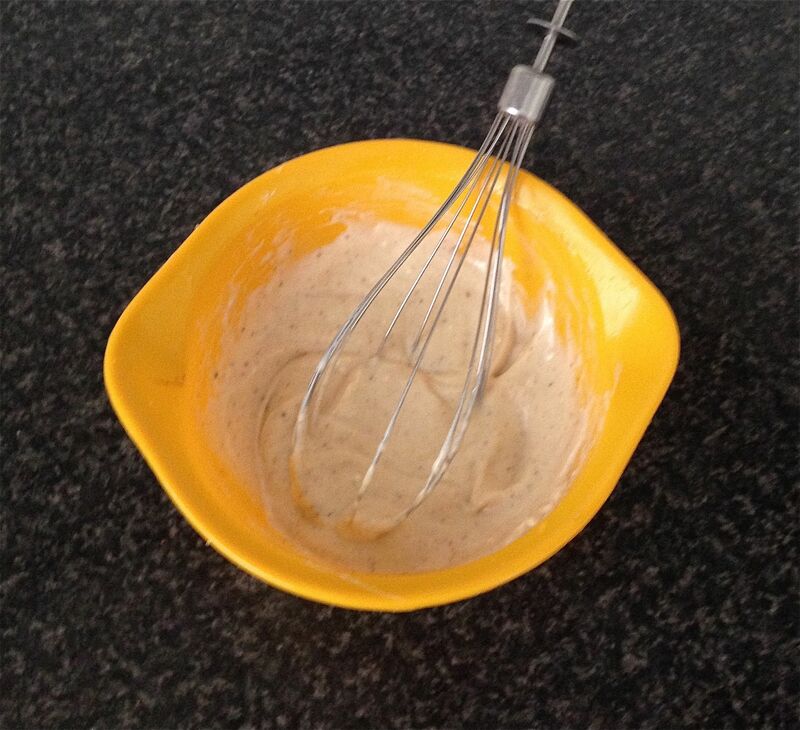 Meanwhile with electric beaters whisk the ricotta and icing sugar until well combined. 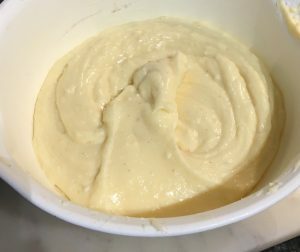 Add the cream to the ricotta mix and whisk until well combine and smooth and place in the fridge for later use. Cut the lasagna sheets to fit I the tin perfectly. 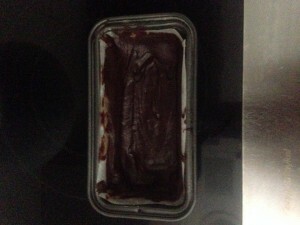 Spoon 20g of Nutella onto each lasagna sheet and spread with the back of a spoon to evenly cover to sheet. 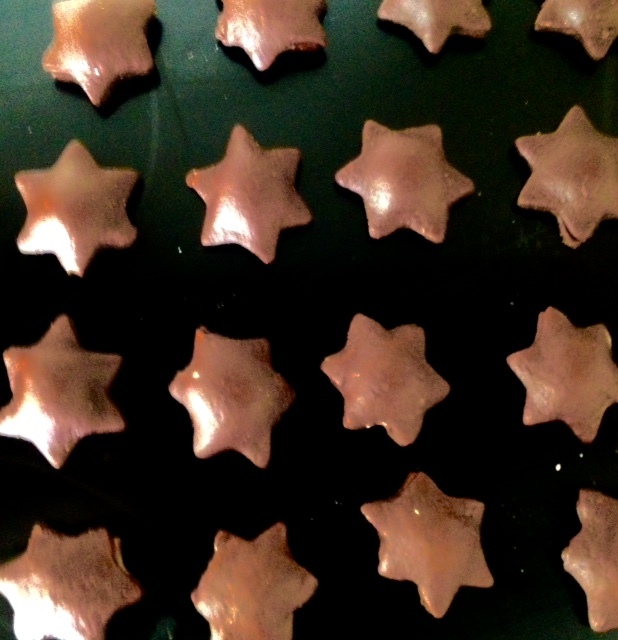 Dice the chocolate into small pieces and sprinkle the chocolate evenly over the Nutella, leave the sheets aside for later use. 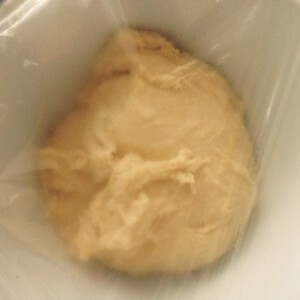 Remove the plastic wrap from the custard mix and add the ricotta mix, beat until smooth and combine. 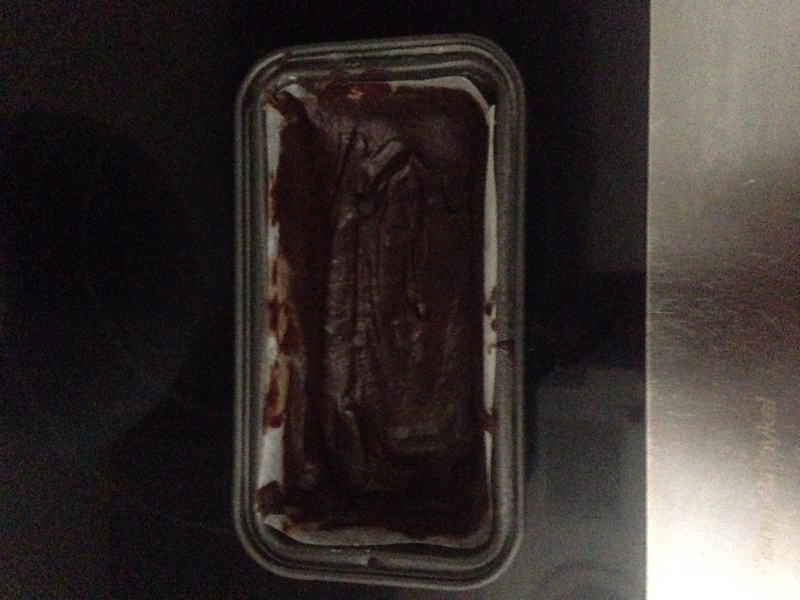 To put the cake together, spoon 1/5th of the filling into the prepared cake tin. 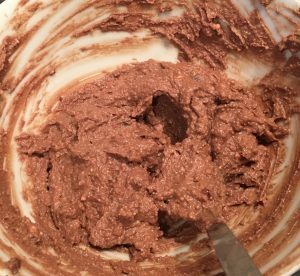 Spread with the back of a spoon for even coverage. Add a lasagna sheet and top with another 1/5th of the filling. 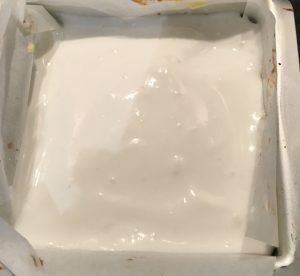 Continue with the lasagna and cream layering until all 4 sheets have been placed and the last 1/5th of filling is placed on the top of the last sheet. You should have done 5 filling layers and 4 sheet layers. 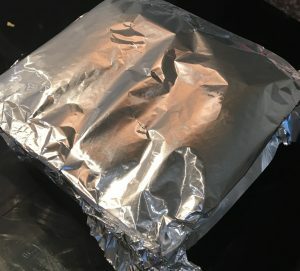 Cover the top of the tin with aluminum foil and bake in the oven for 25 minutes. Meanwhile make a meringue by placing the egg whites into a bowl and whisking with electric beaters. 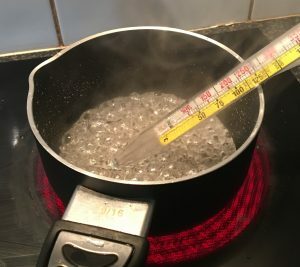 Place the sugar and water into a pan on high heat stirring until the sugar dissolves then leave the mix until a candy thermometer hits 125c degrees. Slowly take the sugar syrup off the heat and in a slow and steady stream pour the syrup into the egg whites. Continue beating the egg white mix for 5-10 more minutes or until glossy and silky. 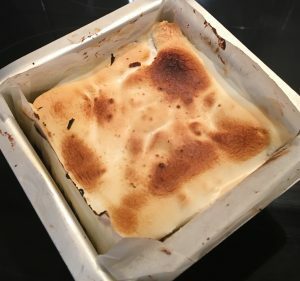 Remove the lasagna from the oven, remove the foil and spread the meringue over the top of the cake. 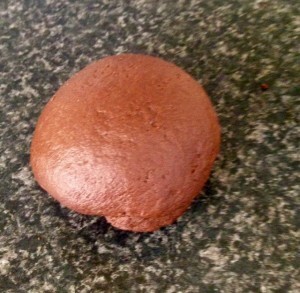 Place the cake back in the oven for 10 more minutes to cook the pasta through and bake the meringue until golden brown. Leave the cake aside to cool in the tin then cut into squares, place slice of lasagna onto a plate with a side of vanilla ice-cream. Tags: chocolate, Chocolate and Hazelnut Sweet Lasagna, hazelnut spread, lasagna, Nutella	. Posted on May 20, 2017 Posted in Unique	. 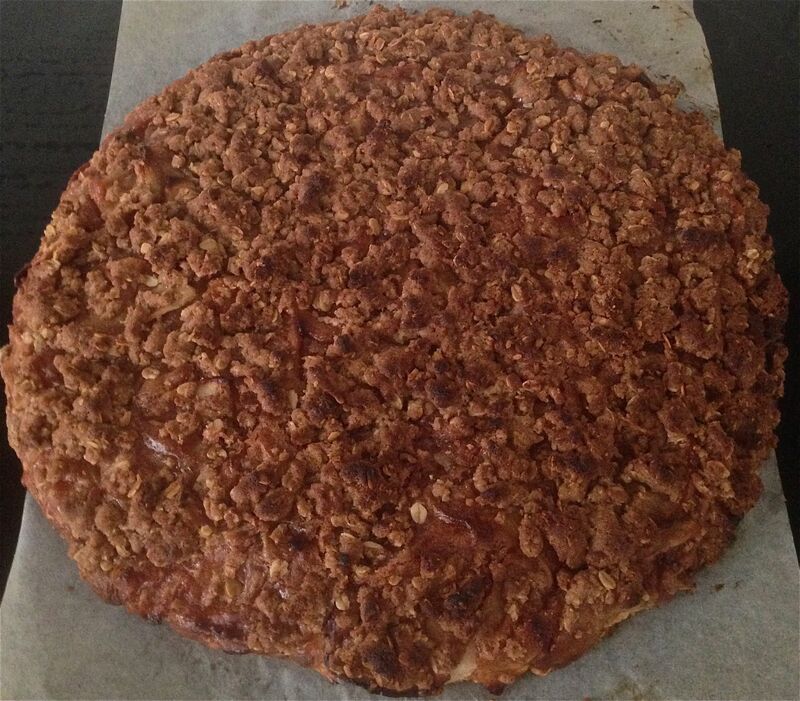 You may notice every now and then I get inspired by savory food to reinvent as a sweet version (etc my Apple Crumble Pizza recipe). More than often they don’t translate as well as hoped, however some are a great success and make it to this blog. This recipe is just that. 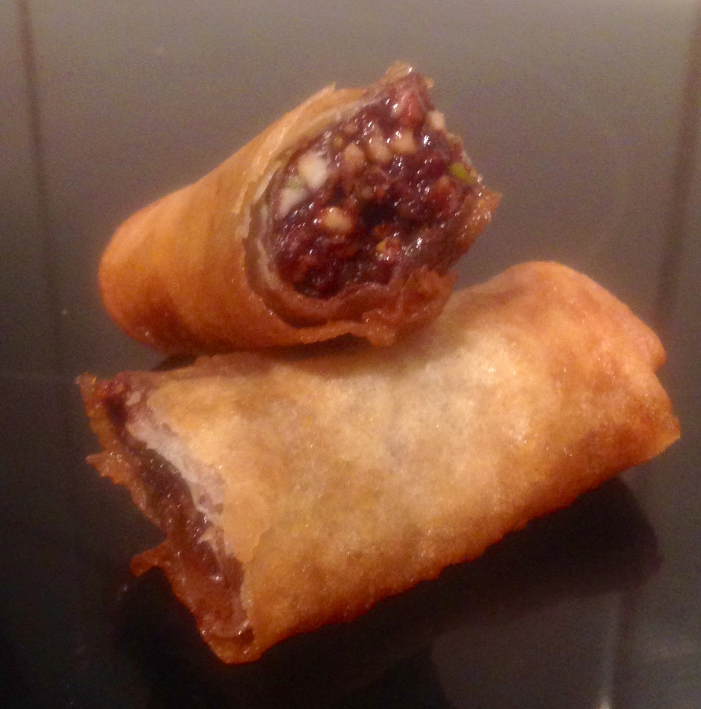 After making spring rolls from scratch the other day it got me thinking about creating a sweet version with nuts (a bit of inspiration from baklava as well as cannoli). Cannoli is just fried pastry with a filling…the springroll wraps are also pastry….baklava is nuts, spices and syrup wrapped in pastry…in a way this recipe is almost the Asian version of the Greek Baklava or the Italian Cannoli. 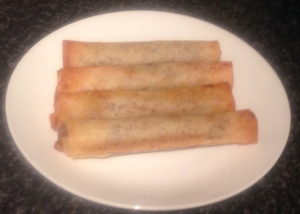 Strangely I actually prefer springrolls baked than fried so I decided to try both cooking methods for this recipe and the baked was the winner. Pre-heat the oven to 190c degrees and line a baking tray with baking paper. Place the nuts, cinnamon, cloves and semolina in a food processor and process until just diced, place in a bowl. Heat 100ml cream in the microwave until boiling then add in the chocolate. 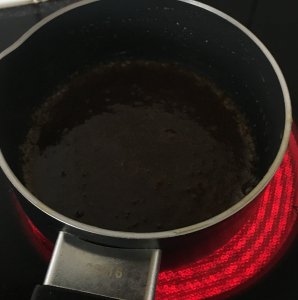 Leave for a minute then stir until the mix is a thick glossy consistency. 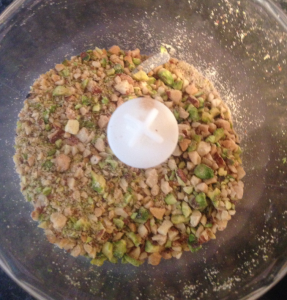 Stir the chocolate mix into the nut mix until well combined. Brush a pastry skin with melted butter and cut a 5cm strip off vertically. Place 30g of the chocolate nut filling in the spring roll skin in a straight line. 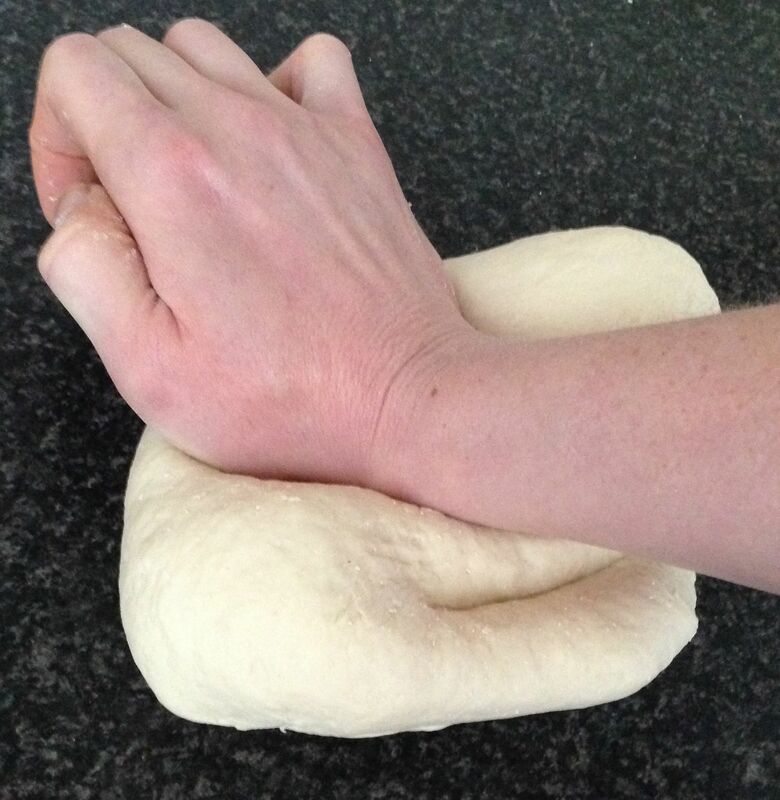 Fold the 2 vertical sides in and then roll up horizontally. Add a little extra butter to the end of the skin to ensure it seals well, repeat with all mix and skins. 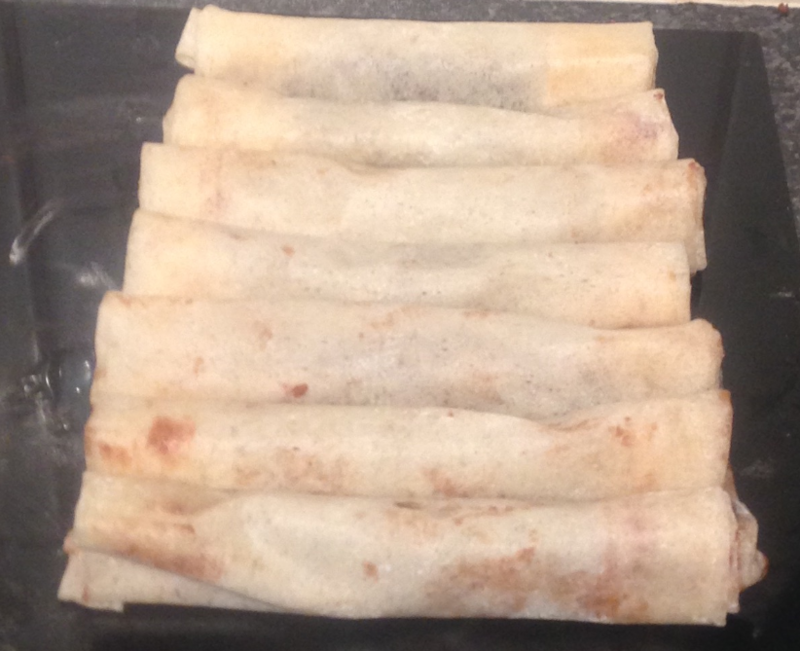 Place the springrolls onto the prepared baking tray. 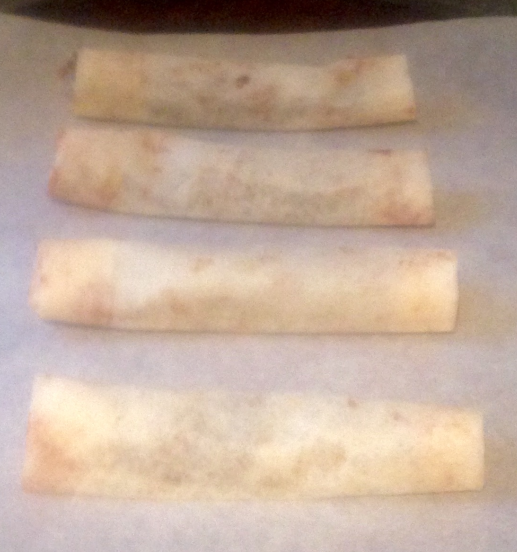 Bake in the oven for 10 minutes or until the spring rolls are golden. 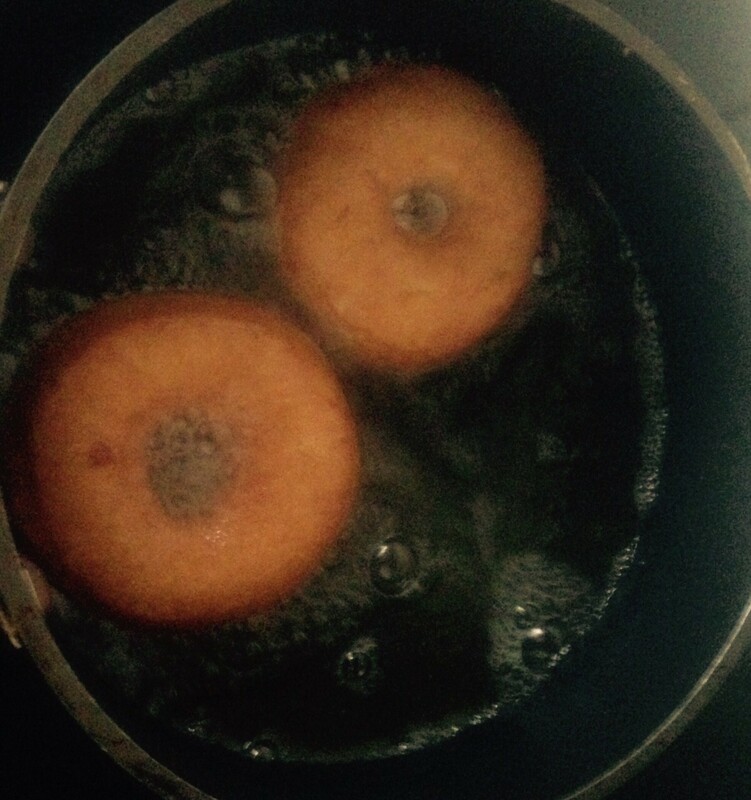 Meanwhile, make the syrup by stirring all the ingredients in a saucepan on medium heat until the sugar dissolves. 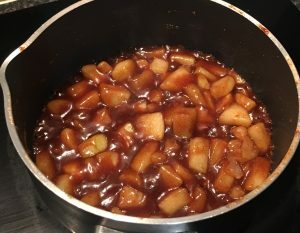 Bring to the boil then reduce the heat to a simmer and leave without stirring for 5 minutes or until slightly thickened, following remove the peel. 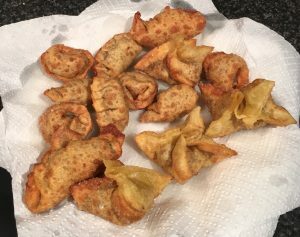 Once the springrolls are cooked pour the syrup over the pastry, or alternatively serve the syrup in a dipping bowl for guests to enjoy. Use a candy thermometer to heat oil for frying to 175c degrees in a saucepan. 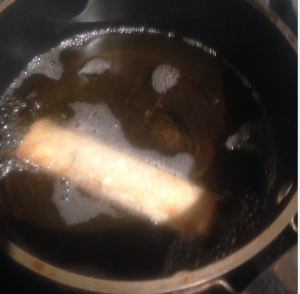 Place into the oil the spring rolls one at a time until golden brown. Once cooked place spring rolls on paper towel, enjoy! 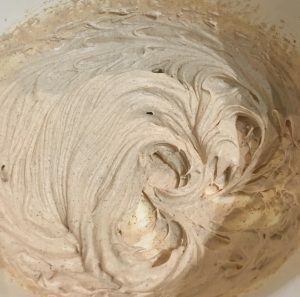 I recommend you whip with electric beaters 150ml thickened cream with 1 tbsn of icing sugar until peaks form and serve on the side OR serve with a scoop of ice-cream. 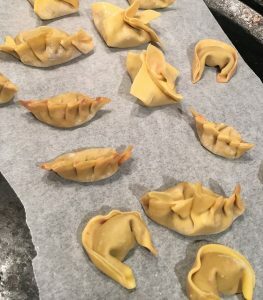 If you cannot find spring roll pasty you can use filo sheets, just brush them with butter, fold in half and brush again. The fried version can be used if you are serving the springrolls straight out of the oil. 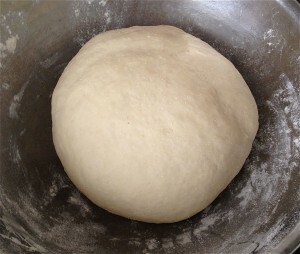 If you are cooking in advance you need to bake them otherwise they will be soft (baking the pastry will keep it crispy). Tags: chocolate, Chocolate and Nut Springroll, Nut, Springroll	. Posted on April 9, 2015 Posted in Unique	. While on holiday at the start of the year a friend professed her love for the chocolate bar Chomp. We were in the supermarket and she saw the Chomp bar, which is quite a rare find and had to have not one but two. 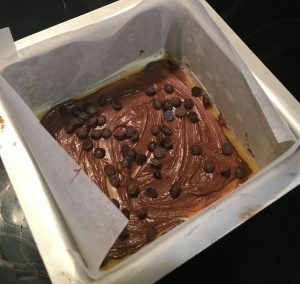 Somehow we got onto the subject of me making a ‘chomp cake’…A few bars later and an analysis of the key ingredients that go into the chocolate bar and I was pretty sure I could replicate the bar on a large scale. Therefore introducing my Novelty Chomp Chocolate Bar. 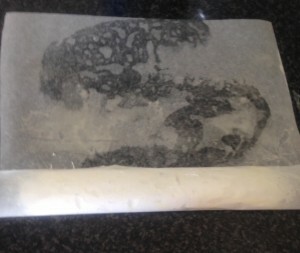 Line a 15cm x 8cm loaf cake tin with baking paper. 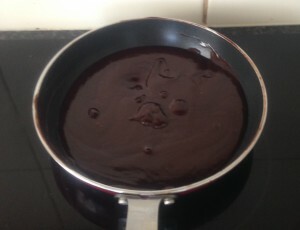 To make the chocolate ganache heat the 50g cream in the microwave in a bowl until boiling. Add the chocolate to the cream, wait 1 minute then stir the chocolate until a thick and glossy consistency has formed. 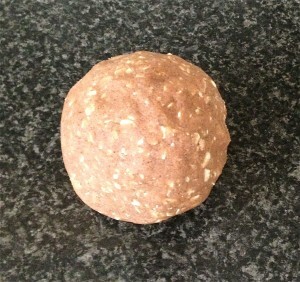 Place the mix aside in the fridge to cool. 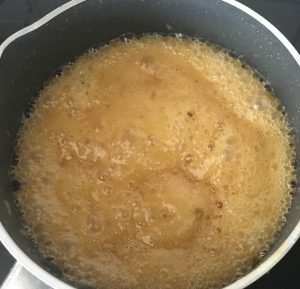 To make the caramel place the sugar and 95g of cream in a pan on the stove and heat on medium stirring until the sugar has dissolved. 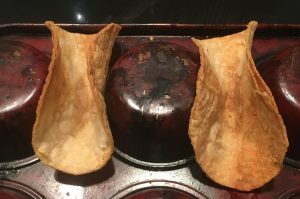 Turn the heat up to high and boil for 5 minutes. Remove the pan off the heat, add the 35g of butter and stir until the mix is glossy and combine. 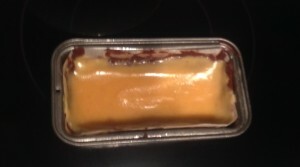 Place in the fridge until the caramel is cooled. 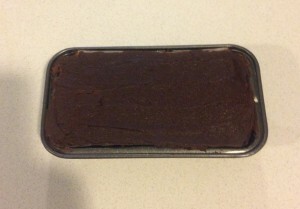 To assemble pour 2/3rds of the chocolate mix into the tin, ensuring you spread the chocolate along the sides as well as covering the bottom of the tin. 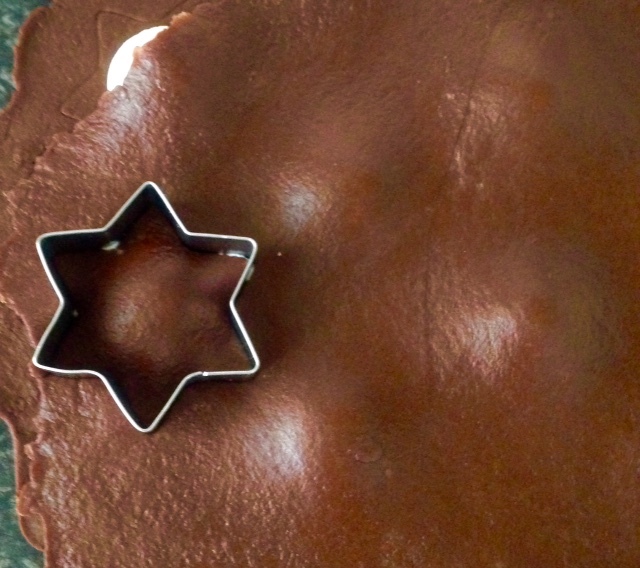 You need to have all the metal of the cake tin completely covered in chocolate. 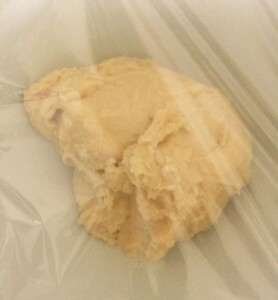 Place in the freezer for 5 minutes or until set. To add the caramel layer you need to pour half the mix into the base on top of the chocolate mix. 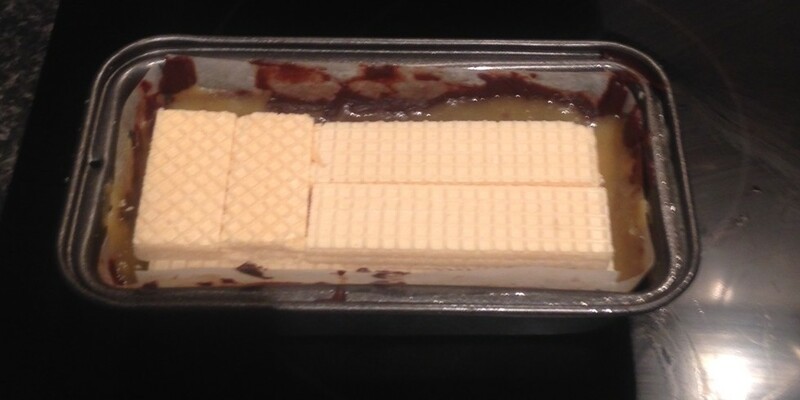 For the wafer layer place 2×2 waffers in the tin horizontally (long ways). 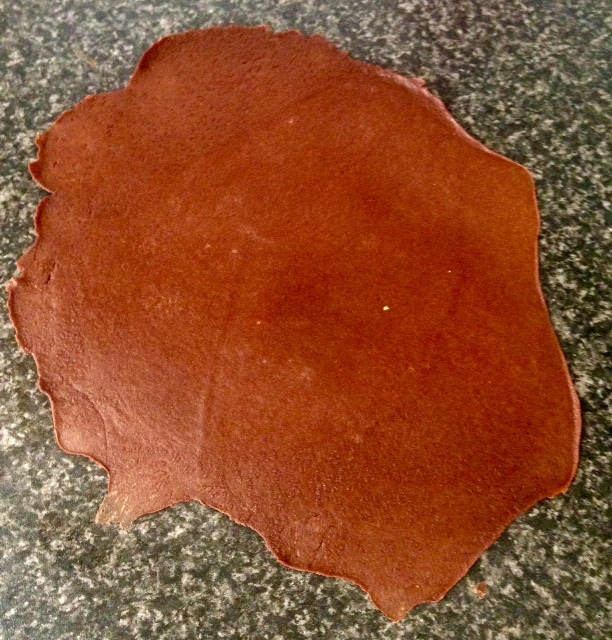 Cut 4 extra wafers to size to ensure complete coverage of the caramel with 2 layers of wafer thickness. Pour the remainder of the caramel on top of the wafers and spread to ensure even coverage. 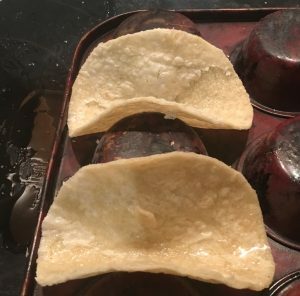 Place the tin in the freezer for 5 minutes. 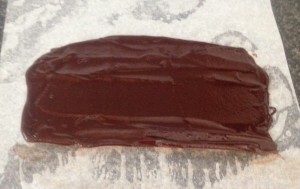 Remove the tin from the freezer and pour the remaining chocolate ganache over the top of the caramel, ensuring even and full overage of the caramel. 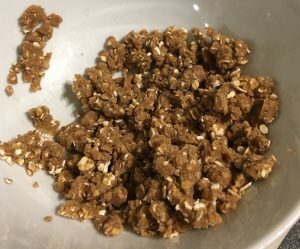 Place in the freezer for 20 minute. To serve turn the tin upside down onto a plate and remove the baking paper from the Chomp Bar. 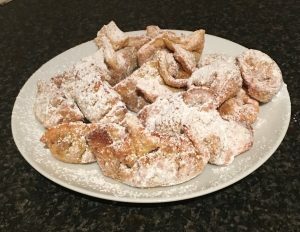 You will only need 8 waffers for this recipe so if you can find a smaller packet (70g) of waffers it would be ideal. Tags: caramel, chocolate, chocolate bar, chomp, Novelty Chomp Bar, waffers	. 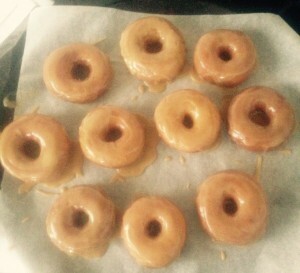 Posted on January 12, 2015 Posted in Unique	. You many recall a while back I made a cake sized novelty Chomp Chocolate Bar. 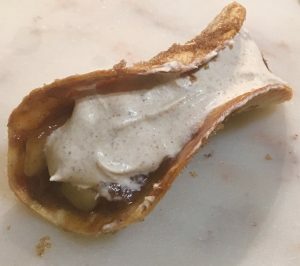 After a friend recently went though my website index and saw the Chomp Chocolate Bar recipe of course I had another challenge thrown at me fairly swiftly. Not one to disappoint, the next day I was in the kitchen with a belly full of summer rolls that were a must to devour to ensure I was 100% all over the ingredients, taste and texture. This experimental session was my first endeavor at making nougat (multiple times to get the texture spot on) and did include many modifications along the way, however in the end the outcome was amazing! Place the peanuts into a pan and on low heat roast the peanuts on the stove until a slight golden colour forms. Set the peanuts aside. 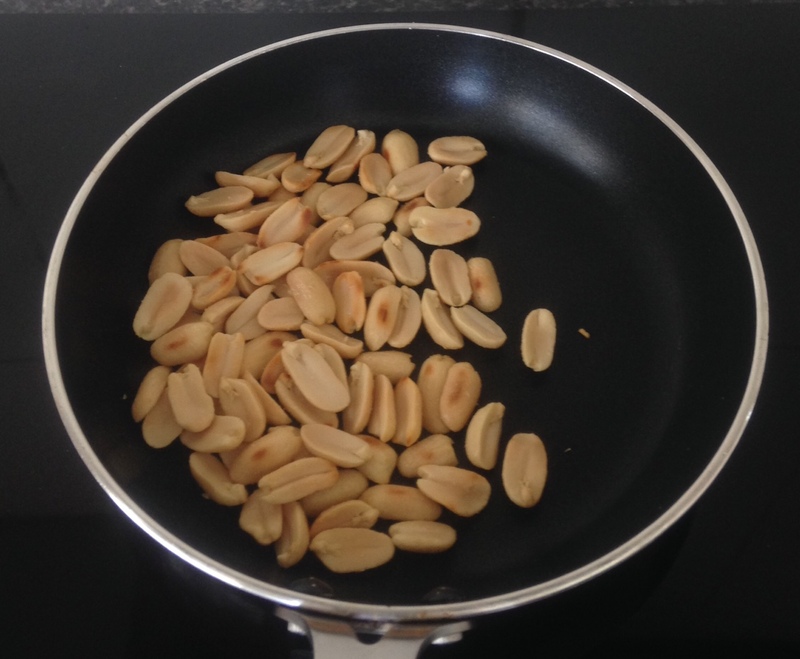 Place the coconut into the same pan and again roast until the coconut has a slight golden colour. Set aside. 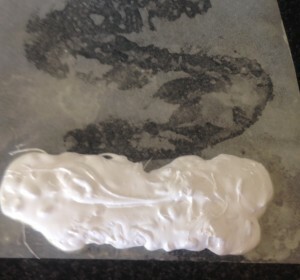 Place a piece of baking paper on a tray with oil spray on both sides of the paper. 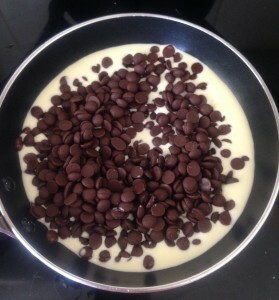 To make the chocolate place the cream in a saucepan on a low heat on the stove and add in the chocolate chip pieces. 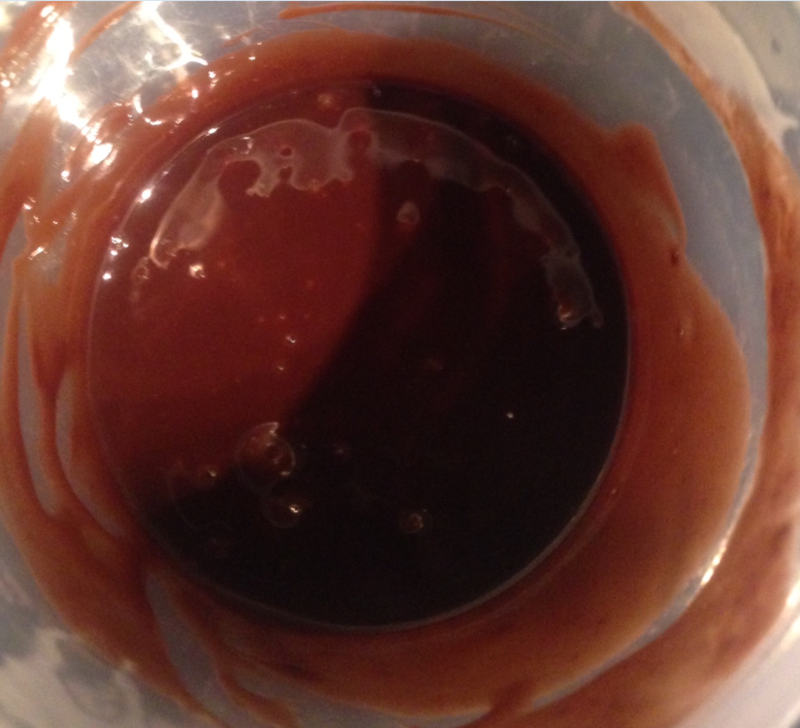 Once the chocolate begins to melt you can remove off the heat and stir the mix until the chocolate is smooth and glossy. Set aside for later. 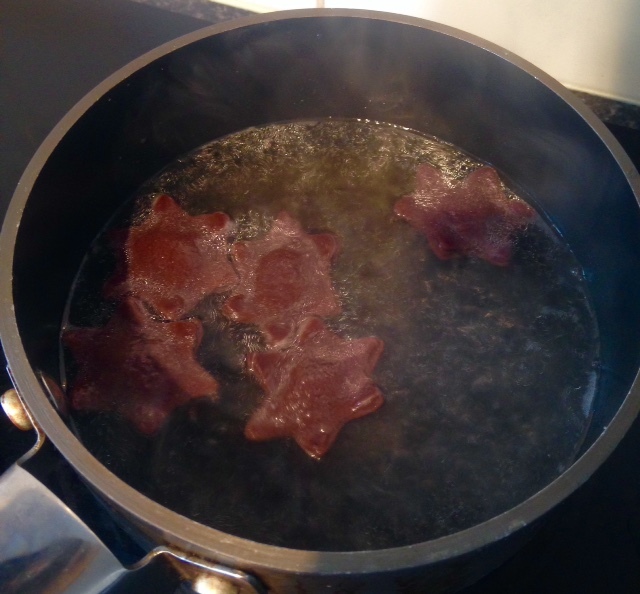 Place the sugar, glucose syrup, and 20ml of water in a saucepan and stir on a medium low heat for 10 minutes. In the meantime place approx. 10cm of water in an empty the sink to cool down the bottom of the saucepan immediately for later. Beat the egg white with electric beaters until firm peaks have formed. 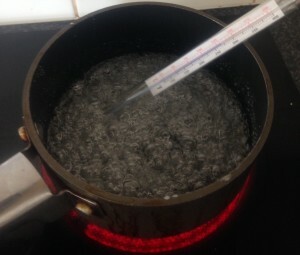 Increase the heat of the stove for the sugar mix to high until the mix boils, then place a sugar thermometer in the mix and keep an eye on the temperature. 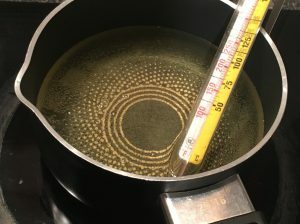 Once the temperature hits 150c degrees remove off the heat and place the bottom of the pan in the sink of water for 5 seconds or until the bubbles subside. This will stop the temperature climbing past 150c. 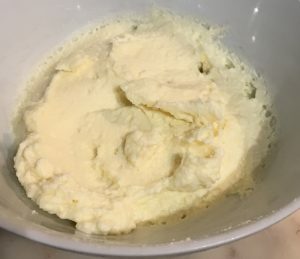 On a medium speed of the electric beaters whish the egg whites again while you carefully pour the sugar syrup into the egg white mix in a slow and continuous flow. 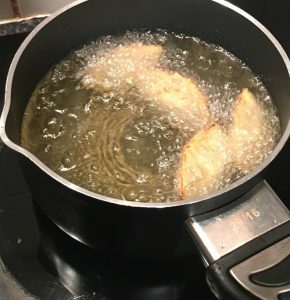 NOTE It is important not to pour the sugar syrup on the side of the bowl or on the beaters as the syrup with seize before it is incorporated into the mix. Once the syrup is all added in continue beating for an additional 3 minutes. Add the vanilla and the peanuts to the mix, stirring to combine. 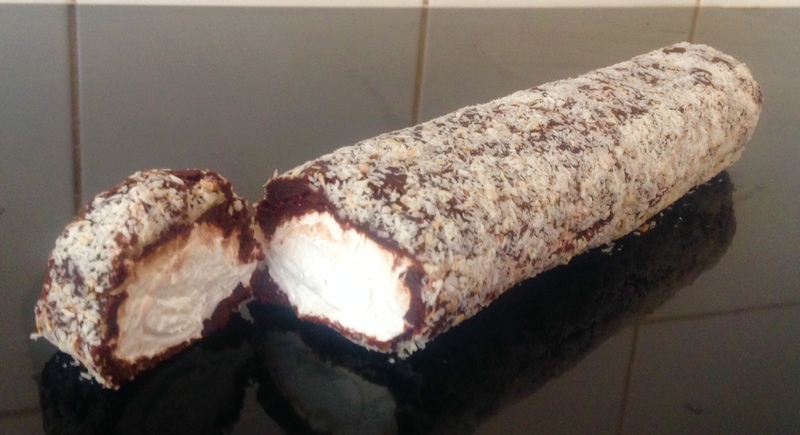 Spoon the nougat mix onto the baking paper in a log shape and roll the baking paper, twisting the paper at both ends to ensure the nougat is tightly enclosed in the log shape. 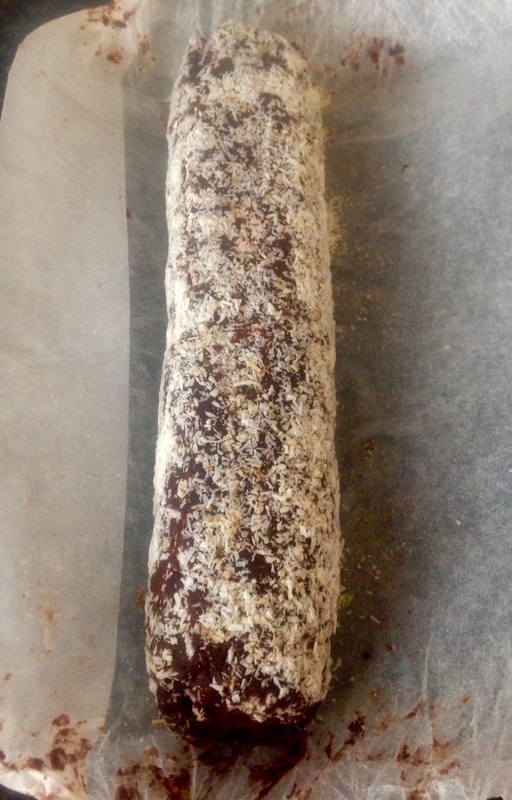 Place in the freezer for 15 minutes to set. 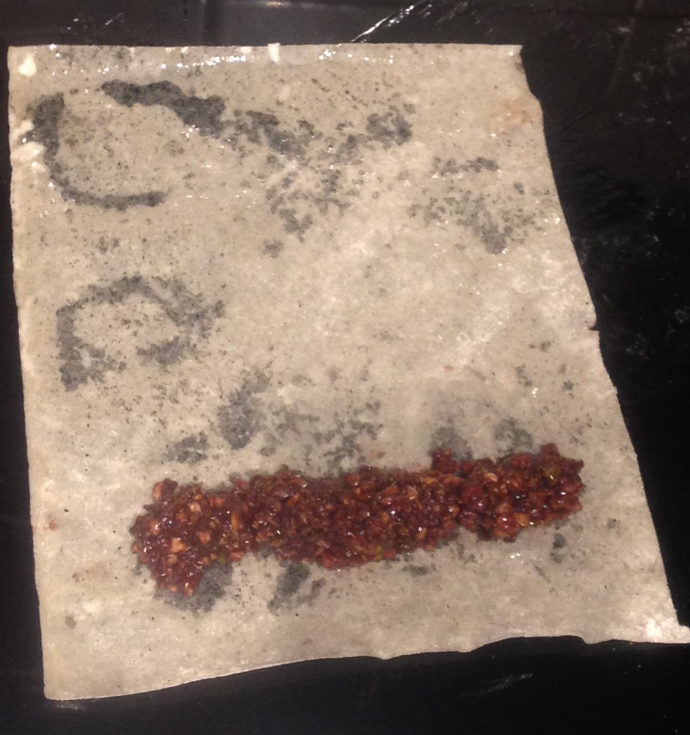 On another piece of oiled baking paper spread out the chocolate mix from earlier in a fat log shape, big enough to cover all sides of the nougat log. 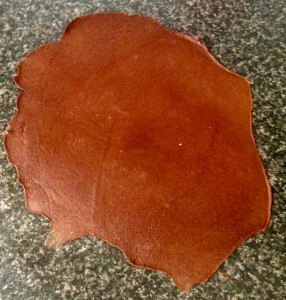 Remove the log from the freezer as well as the accompanying paper and place on the spread chocolate. Roll the baking paper with the log in the center ensuring the log is completely covered in chocolate. Again twist the ends of the baking paper to enclose the log with chocolate and carefully with your hands place some pressure on the log while rolling to ensure a full distribution of the chocolate on the nougat. 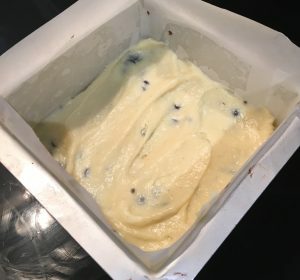 Place in the freezer again for 5 minutes. Remove the roll from the freezer and carefully unravel the paper completely. 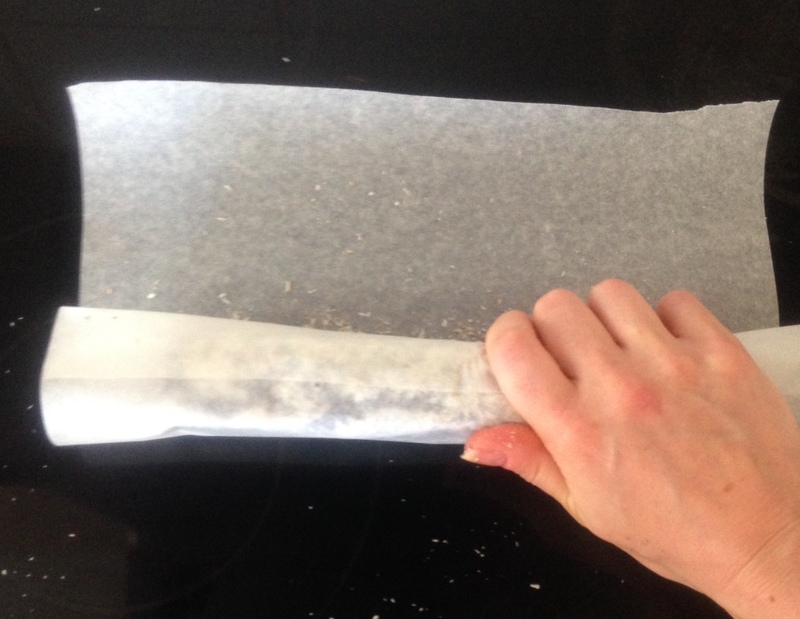 Sprinkle the coconut all over the baking paper and roll the log along the paper, pushing the coconut into the roll as you roll it. 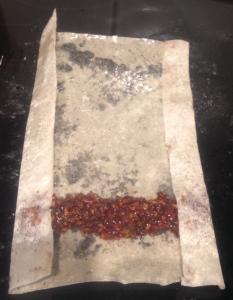 For the last time re-roll the log in the baking paper and twist the sides. Place in the freezer for 10 minutes to set, following cut to enjoy. 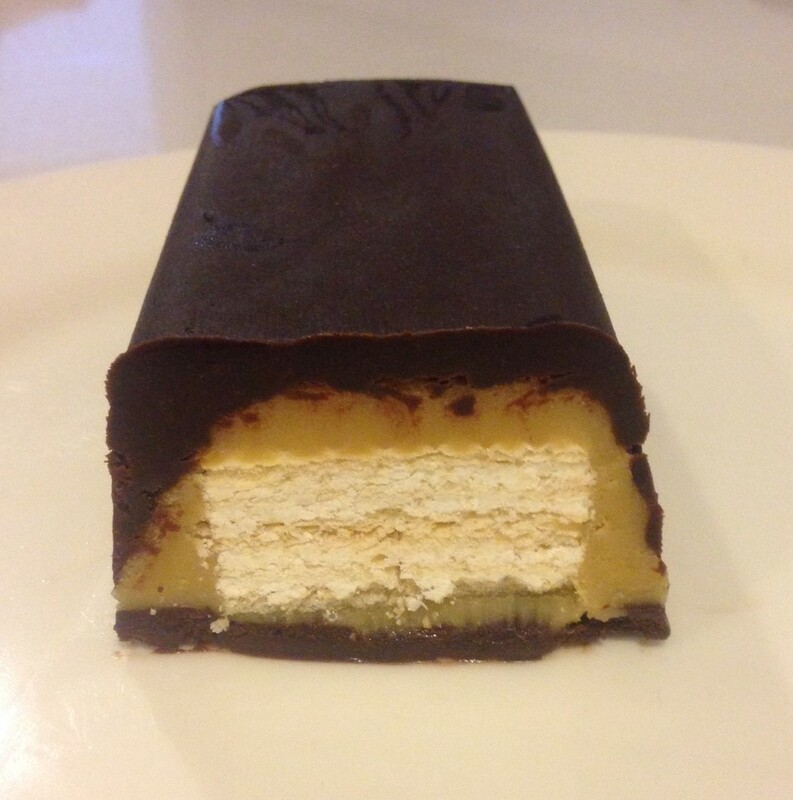 Tags: chocolate, chocolate bar, coconut, nougat, Novelty Nougat Summer Roll, peanuts, summer roll	. Posted on November 17, 2014 Posted in Slice, Unique	. You may have noticed by now that I do love to play with American style flavor favorites, (see my Devils Food Cake, Chocolate Bacon Cake with Maple Frosting, Spiced Pumpkin Pie, Hummingbird Cake to name a few). The whole savory and sweet combo they commonly serve is so interesting, something we don’t see much in Australia. One thing I have yet to experiment with is their famous peanut and jelly (jam in AUS) sandwich, I don’t even think I have ever tasted one in my life. So true Ella style instead of first tasting I threw myself into experimenting with this concept to incorporate these 2 key ingredients in a sweet baking tread. 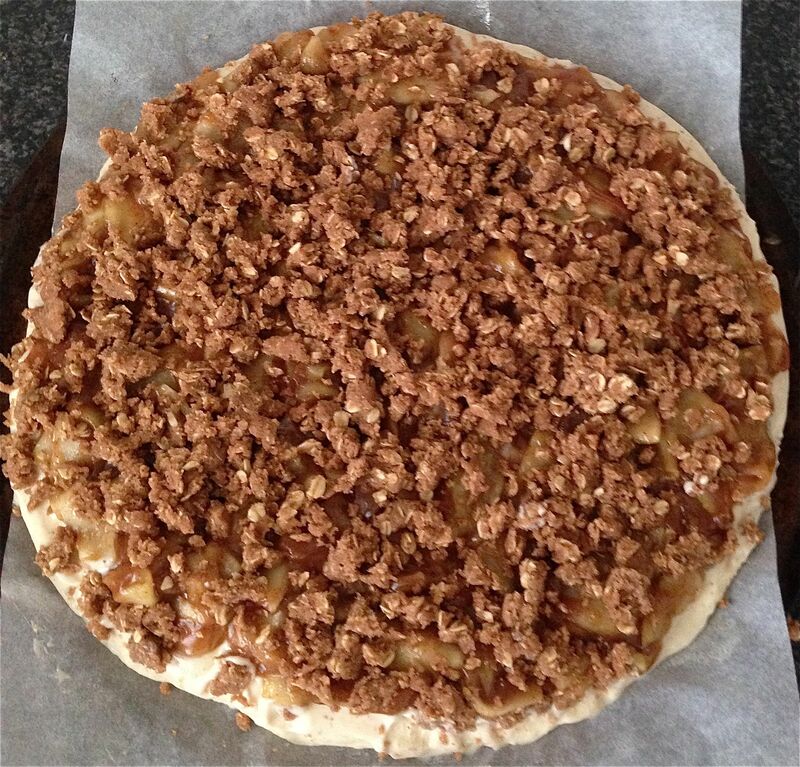 I must say I attempted 3 versions of this…Originally I made a 3 layered slice with a peanut butter, a jelly and a white chocolate crumble topping slice. 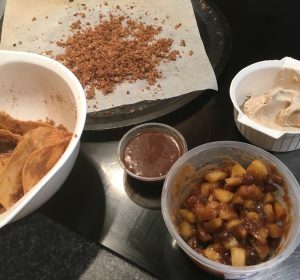 I wasn’t happy with this so I attempted it again with just the 2 layers and omitted the crumble layer – as suspected the jam turned into a toffee texture without the crumble layer to protect it. 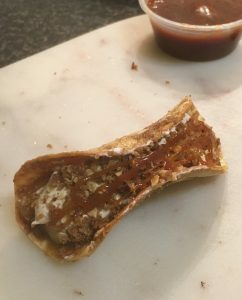 As the peanut layer was absolutely delectable and satisfying I decided to slice pieces in half like 2 pieces of bread and with thick jelly (jam) placed in the center to sandwich the peanut slice together. Outcome…better that expected – absolutely scrumptious! Best part (bar the taste) this is sooo easy to make! 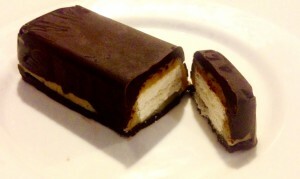 Below is the recipe to me easy Peanut Butter and Jelly Slice Sandwiches. Preheat the oven to 175c and line a 20cm square baking tray with baking paper. In a bowl using electric beaters beat butter and sugar for 5 minutes until thick and creamy. 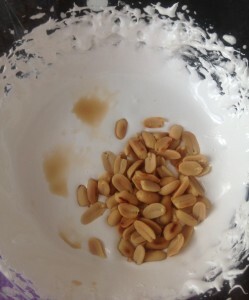 Add the peanut butter, egg and vanilla essence, beat. 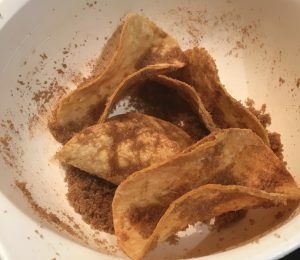 In another bowl mix together the flour, powder, salt and cinnamon. 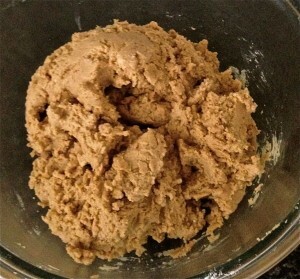 Using a spoon carefully fold the dry ingredients into the wet mix until just combined. 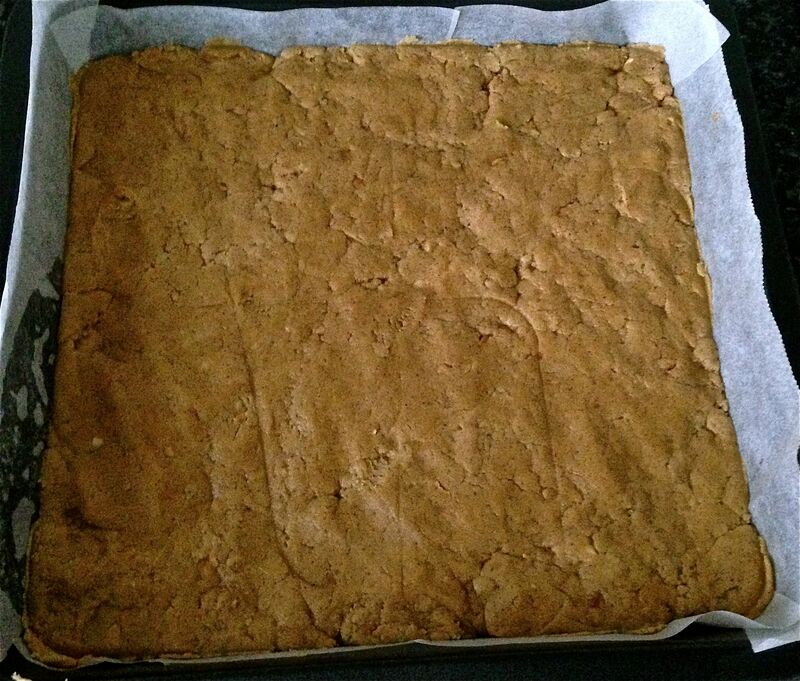 Spoon the mix into the tray and smooth out. Cook for 35 minutes or until golden. 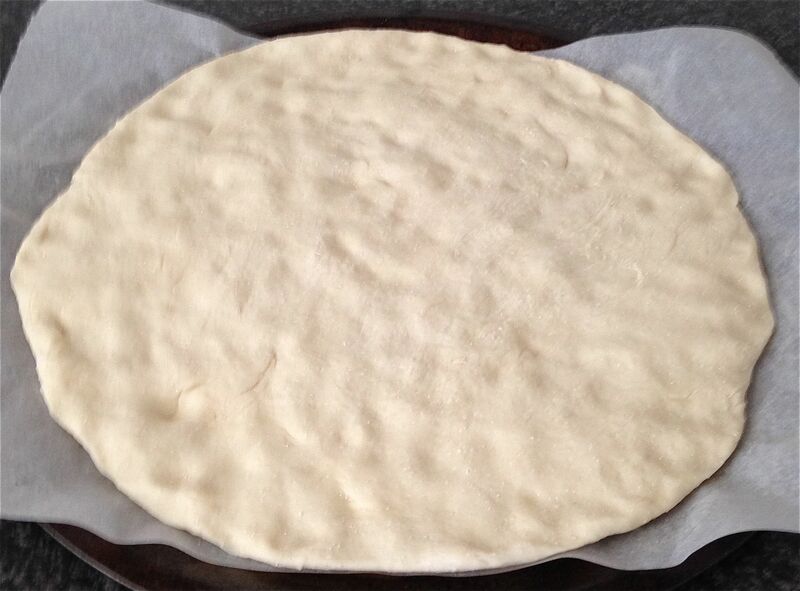 Allow the slice to fully cool then cut the slice horizontally through the middle. 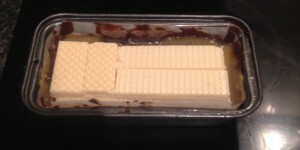 Place the bottom layer back into the tray and spoon the thick jam to cover the bottom layer. Place the second layer on the top of the jam to create a peanut slice sandwich with jam in the centre. 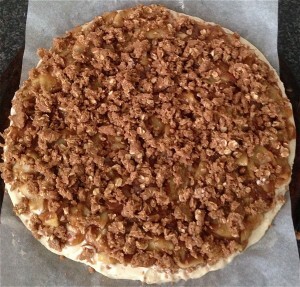 Allow to set in the fridge for 2 hours before removing from the tray and cutting the slice into bars. You can use whatever flavor jam you prefer, though raspberry is the most traditional. The jam does need to be quite thick. 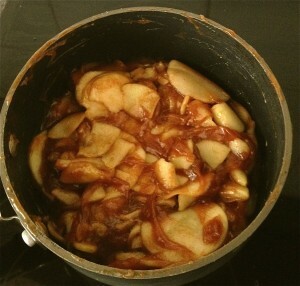 If its not heat it in the microwave or on the stove until bubbling hot then whisk in 1 tsn of gelatine powder. Allow to cool, then follow on from step 9. Tags: jam, jelly, peanut butter, Peanutbutter, rasberry, slice	.